When I started the Automatic Drawing with my boyfriend, it felt like there was no thought process to it, our hands just flowed. We let the pen talk and just kept going like if our hands couldn’t stop going. I thought this activity was awesome! We had so much fun doing it, even my boyfriend wanted to keep going. The end result happened to be a bunch of loops and circles and ongoing lines. I decided to go “beyond” and we both colored it, without putting thought to it. Automatic drawing is a good way to just let your emotions out and relax! I decided to ask my annoying little sister, Taylor to be part of my art experience and she was excited to try something new… We were sitting across from one another on the floor with our legs crossed and had blue on our right hand and orange on our left and drew with both hands simultaneously. 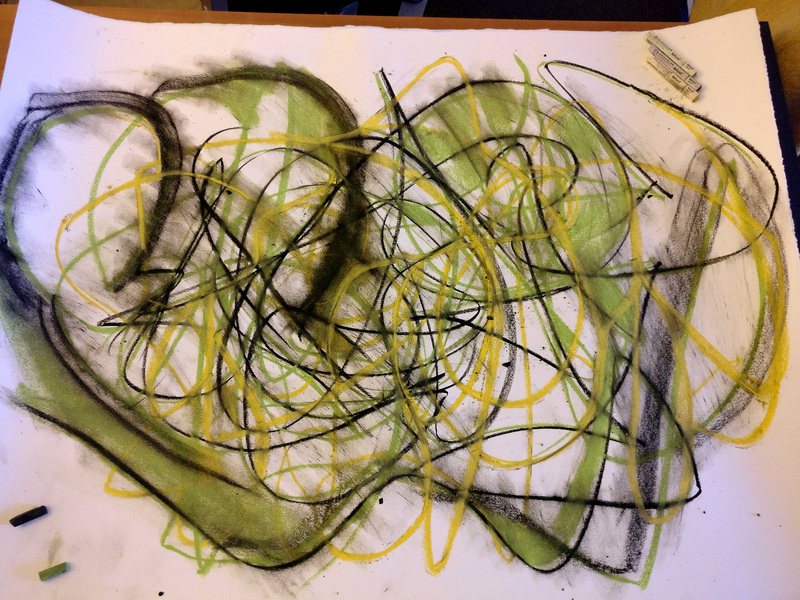 After, we used yellow and had all four of our hands on the yellow pastel and started drawing. We had the radio turned on in the background to create a relaxing environment, it helped us focus on the art. At first we couldn’t stop laughing because it was difficult to come to an agreement with what we were going to draw, I kept feeling a force that prevented me from navigating the way I wanted to go. In the beginning we could not sync up with what direction we were going to draw and we broke a couple of the crayon pastels. However, after a minute or two we both just started drawing and it felt automatic. I found it weird how towards the end we did not need to verbally communicate about the drawing, it was like we were reading each others minds and knew what we wanted to draw. I really liked how our drawing turned out… I enjoyed this weeks activity and it allowed my little sister and I to bond together!! As we were drawing it was very relaxing we took turns guiding the pastels. I really liked how we did not have to say a word to each other while drawing it just happened so naturally. After all of the blending and adding a few lines it looked like a tornado with a man standing at the base of its path. To me the tornado was a metaphor for his life unraveling before his eyes. He is a powerless man and eventually the mess in his life will consume him. I could also see the drawing in a positive way if I were the figure at the bottom of the tornado. Lately I have been stressed with my new job and school, however, somehow I am keeping it together and I am still standing as the tornado as it heads off into the distance. Overall, this was a cool experience and I would recommend people to give it a try. We began our conversation by talking about something simple–how our day was. Then, we moved onto talking about when we went to drink boba tea earlier, and I told her I’d taken a sip of her drink without her looking, which caused her to make a hard streak onto the paper. We switched pastel crayons often, considering she broke the yellow one. We managed to never looked down on at the paper, since we wanted to be surprised at what the final result would be. Five minuted had gone by, and we ended up laughing about the fact that tomorrow is my birthday and she doesn’t have a gift prepared for me yet… All in all, I enjoyed this project. It may not look like much, but it gave my sister and I a reason to have a nice conversation. Maritess Anne Inieto & Brian Sath with the automatic drawing they made. Apparently automatic drawing takes a lot of Starbucks. And a little Twix, of course. you could either go with the flow, or make the flow. When our flows would match, we would make very wide, circular shapes. When one of us would try to take more control than the other, we would end up with jagged edges because our hands couldn’t tell where the pastel would go. When one of us would try to take control over the other, we would also end up breaking the pastel. We broke the pastels multiple times, actually… I would suggest anyone who is undergoing some stress to do this activity because it definitely relieved some stress while I was studying for my midterms. I did this activity with my boyfriend and I must say, out of the five years we have been together we have never done anything like this before. We did the automatic drawing in my living with the lights dimmed while we listened to Coldplay. Who knew so much emotion could be the end result of drawing. This experience was different for me. It was an unfamiliar feeling and I’m not sure if that’s a good thing or bad thing, but it was interesting to see how such a simple task can turn into something more. This experience turned out to be so different than what I had imagined. But maybe I learned something about my relationship or we both learned something about each other. at first it felt more like my sister and I were fighting for control of the chalk rather than working together, but we got the hang of it eventually. After finishing the first set of lines we decided to give it a try with another color. It was much more than just random squiggles, it represented a connection between me and my sister in that every curve of that line, and the direction it took wouldn’t have been the same if it weren’t for both of our contributions. Next thing you know, I was like, “Oh my god. I’m gonna find Johnny Cash’s name in this…” It took me about 10 minutes to find each letter – ones that looked the most like the actual letter. I then decided to color in random shapes and empty spots in and around the entire ball of scribble with the two other pastel colors I got in my art kit which were a lime green and yellow. Completing this activity made me realize how honest and how creepy the energies of people can be… My boyfriend being the jokester that he is decided it would be funny to rub his hands all over the poster after we scribbled on it which made me pretty upset because I thought it was ruined. So i grabbed the black pencil and began scribbling over everything once more. As you can see the top of the photo was the side I was sitting at and it’s pretty dark. I’m guessing it was because I was upset so I put more pressure on the pencil. Eventually I wasn’t so upset anymore because it actually looked pretty cool and I thanked him and apologized for over reacting. Then the crazy thing we realized was that it almost looks like a heart. Awkward! 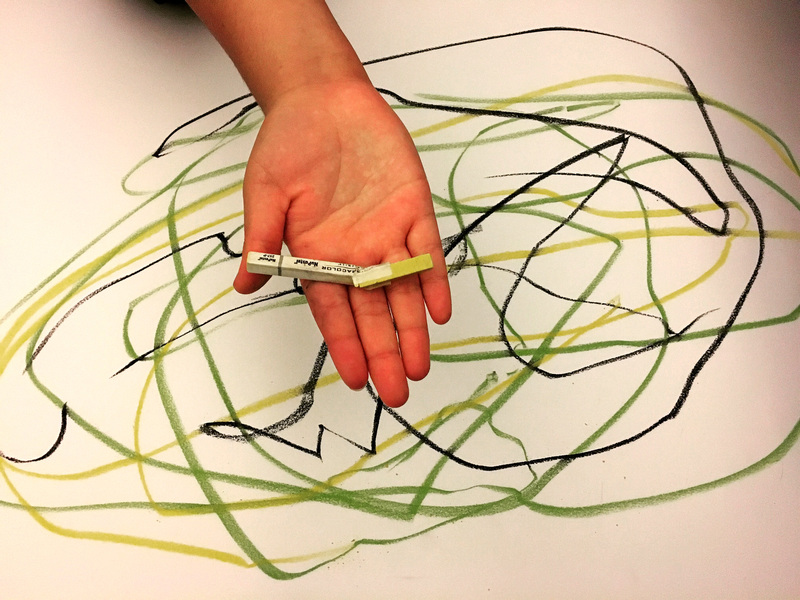 This week I thought I would use this art activity to reconnect with my younger sibling Leslie, who recently simply was not having it with me. Even though I could’ve done it with anyone else I chose to do it with her because I was tired of the tension between us. My mother practically forced her to do it with me. It was the only way I thought the tension between us would be released. I think it was the first time in two weeks that I’ve seen her smile at me again. It was also the first time in two weeks that she giggled endlessly because of how awkward a silly automatic drawing was for both us. At first, it wasn’t getting either of is anywhere so we decided to play some music to help us. I played a couple of our favorite songs including, Paranoia by A Day to Remember, Cynical by Blink 182, and Not Good Enough for Truth in Cliche’ by Escape the Fate. Our hands started moving towards the beat of the music! Finally we were getting somewhere! Through the activity itself and the songs we realized how much better things are when we are both laughing and having fun with each other. I honestly felt that this activity was gift from whatever force there is out in the world! In the piece itself I think you can really see all the feelings between us. In the black you can see the release of my sister’s frustration at practically being forced to do the activity. In the green you can see the beats of the music playing in the background. In the yellow you can see our laughter and at last the reconciliation between the two of us. Overall an activity, that brought peace between two siblings. We were giggling a lot as we let the colors move themselves and it was a lot more fun than we expected. We had snacks and brownies on the side and we were all hyped up on our sugar high, which could have explained the craziness in our art piece. After we had our fun, our piece looked very interesting. It had an abstract feel to it but at the same time, it seemed very organized. There were loops and circles and it ended up becoming a giant figure of black and green. At first, it was difficult to draw because we both did not know what direction to draw in and we hesitated to be assertive in where we wanted our pastel to go next. However, we both were very relaxed and did not get frustrated because we found this as an opportunity to create something freely without direction. After multiple turns, swirls, and spins, we were getting the hang of the art and it flowed naturally without much effort. I’ll admit that it was difficult having our eyes closed because I wanted to look and pick my next move. However, closing our eyes forced us to focus on the movement rather than perfecting the piece so it was a nice change for once. Overall, the experience was great! It was not once stressful or hard, rather, a fun and carefree one. I very much enjoyed this project because it felt as if it united two people because we were only allowed “one” hand to draw. By one hand I mean that we had to put all hands and force into one pastel to create our piece. I’m more than happy with the results because this is the most natural art experience I have ever had and I am proud of the art. This piece will always remind me of the fun laughs, and good memories I made. Sometimes it’s about the meaning behind it, rather than the actual visual image, and that’s why I love this piece so much! We did this project with our eyes closed so that our product would be a surprise. After a couple minutes we agreed to open our eyes. It is hard to explain why I like this piece, because it does look like a three year old made it. I just really enjoy the idea behind it. Me and someone very special to me made this together without thinking. I feel in a way it reflects our relationship. We work together to create something that can sometimes feel a little crazy but overall is something beautiful. While it may not be the most appealing work of art to others, it has now become one of my favorites. I did this week’s activity with my boyfriend. We looked around the house and drew whatever we saw: my cat, a pumpkin, random shapes, and scribbled our names. Without looking, of course! After that, we decided to color everything in. Here Erika and I are in the zone, letting our subtle unconscious movements guide the pastel across the paper… The greatest difficulty was to not break them. Four hands on the fragile pastels was not the ideal condition for them. Breaking all three of the colors that we had (Yes we made a pastel graveyard). I will admit it was not in my comfort zone to let go of my conscious effort to create something instead of just squiggles and lines. I was continuously tempted to consciously use a greater portion of the paper. But i let go and our hands decided to stay in the center. We looked at it and I noticed that one of the curves we made looked like a dragon head so i grabbed the black and began to draw the face. Erika quickly proceeded to draw some of the body, the tail, flames and a surrounding. Even using the pathway as a canvas from not leaving the center with our eyes closed. Astonished at what the final results were. This is where I felt most comfortable, improvising to create something impressive out of completely random and seemingly chaotic. After my last class on Thursday, I met up with one of my classmates, Raul Silva, to work on the art project together. It took a few minutes to find a place but we ended up in a nice shady spot under the trees by the Fine Arts buildings. We then brought out our pastels, laid our paper, and sat ourselves down to begin. The location helped tremendously in helping me ease my mind and letting my hands draw on their own. As cheesy as it may sound, it was the switch of focus to the sound of students walking by, the birds chirping up above, and how the breeze felt on my skin that played a major role in relaxing me. However, brief moments where I was snapped out of my relaxing stage occurred as the fragile pastels broke beneath our hands. For this activity, I had the help of my girlfriend. We went to our local Starbucks to work on it. She’s the more artsy one in the relationship so she was pretty excited to lend an artistic hand. This was new to me and I wasn’t sure exactly what to do. She had done something like this before so she knew what to do. She explained how easy it was and I got it. It was actually a really fun project. I always start these projects intending to finish as quickly as possible but I always end up spending more time on it because it’s so fun. Unfortunately, the pastels in my art kit were an ugly combo: yellow, lime green, and black. Black was messy so we had to leave it out. Yellow and green are okay colors but it could’ve been better with other colors. We went over our markings two or three times. We wanted to color it more but with our two unappealing colors, we decided to leave some color out. This activity was so much fun and made for a really nice date! I did the project with my best friend Jessica. We met up at my house. We sat on these comfy chairs and put this big Atlas book on top of our legs as the board for our paper. At first we felt funny and laughed. After a bit, we got into the groove of things and just started conversing. Our final product conveyed our emotions as we started discussing some frustrations we were having at work. Even the colors are dark to me. At first I thought of a bumble bee because Black and Yellow. This art activity seemed chaotic but I think it was actually the opposite. It was meditating and soothing although it does not appear to be. I would definitely do this again to help release built up anguish. One of my high school friends, Yesenia, is taking Art 110 with me and we decided to do the automatic drawing activity together. The key point of automatic drawing was to let the art come automatically. So we sat on the floor, closed our eyes, and let our markers do their thing!… When we first started Yesenia and I started laughing because we felt a little funny doing this. The markers moved with both our hands on it and we created something pretty awesome. We loved how it turned out. It reminded me a lot like a cell’s nucleus; most likely because I’m taking biology right now haha. Overall it was a great experience! I plan on keeping it for memories’ sake.